Have you noticed people on the train increasingly aren’t reading, they’re watching? In the last few years, there’s been an unstoppable trend toward people not reading to learn but wanting to watch to learn. NHS clinicians are not immune to this trend. They too want to watch not read. 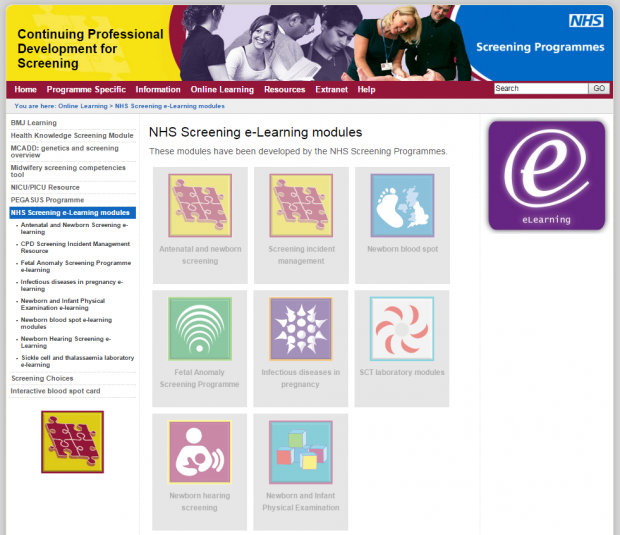 And the NHS Screening Programmes have responded to that in our e-learning modules. The benefit of e-learning over more traditional approaches is that learning can be made more enjoyable and interactive, using films, quizzes and animations. Beginning with NIPE e-learning in Autumn 2013, we’ve moved to make all our new online learning “film-led”. We are minimising the words in our e-learning and conveying as much information as possible in short films. A well edited film can convey much more information in a more memorable way. Take a look also at the Newborn Blood Spot Improving blood spot quality e-learning, which we published in February. It’s basically built around two films – one is a trip to a screening lab following the blood spot card’s journey from when cards arrive at the lab to when the results are obtained. The other film is a midwife explaining how she has changed her practice to reduce her avoidable repeat blood spot card rate. Actually, she makes some refreshingly frank admissions about her previous working habits and how she’s changed them. We’re developing more and more e-learning all the time, with new ones coming out every few months. Our current list of e-learning packages for professionals ranges from a module on identifying and dealing with incidents in screening, to one on Down’s screening, to a module on genetic assessment and screening for sickle cell and thalassaemia. Over 4,200 people have used our modules in just the last 3 months and this figure is growing all the time. In the near future, we’ll be publishing a module on a new ultrasonography “view” of the fetal heart to coincide with the changed fetal anomaly screening standards. We’re planning to publish this in the autumn. This package includes an animation of a fetal heart, which we understand has never been done before! Another upcoming e-learning package is one about changes in the NHS Infectious Diseases in Pregnancy Screening Programme that we’re sure professionals involved in infectious diseases will want to learn about. We’re always looking to improve our training resources, and develop new e-learning modules where there’s a need, so do let us know what you think by contacting the screening helpdesk. In the long term, we’re likely to move our e-learning modules to a new home which will provide more opportunities for additional interactive elements to reinforce key learning messages. We’re currently looking at options and will let everyone know more in due course.